La visita a las principales ciudades de Kosovo, Pristina y Prizren, desde Macedonia puede resultar complicada si no alquila un coche. En esta excursión de día completo, viaje cómodamente en un monovolumen con aire acondicionado desde su alojamiento en Skopie y reúnase con su guía en Pristina. Visite los monumentos históricos como el monasterio de Gračanica, la Biblioteca Nacional de Kosovo, el parque arqueológico al aire libre, la mezquita Çarshi, la Torre de Gazimestán y mucho más. Diríjase a Prizren y realice un recorrido a pie por el casco antiguo de la era otomana. Viaja cómodamente en una minivan con aire acondicionado. Very much enjoyed the trip and it was very well planned and paced. The driver Gjorgji Apcev was excellent and the guide Redzep Ibraimi in Kosovo was also excellent. Both were very friendly and knowledgeable and made sure that everything went perfectly. 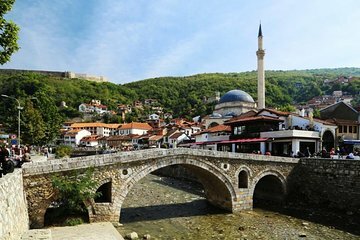 The 2 cities in Kosovo are visitng, but particularly loved Prizren. Enjoyed the lunch options and shopping also. Weather was not good but our driver and guide were brilliant and highlight was monastery in Prizren in the snow ! Fabulous history lesson and amazing drive through countryside so well worth booking to see the sites after the madness of Skopje. Having never visited this area before and not knowing anyone else who had, my friend and I booked this tour with few expectations but wanting to explore. We were delighted and had a fabulous day, this exceeded expectations and we left with a real insight into Kosovo, the people and way of life there. Our driver from Skopje was Robert who is a friendly, calm, polite and safe driver. Upon arrival in Pristina we met our local guide for the two destinations - Suad, who was such a friendly, fun, knowledgable and caring guide. We started our trip in Kosovo by initially visiting the city of Pristina, with its Mother Teresa statue, street market, mosques, Ottoman style buildings, clock tower, statues of Liberty and Bill Clinton, museums, old bazaar etc, then on to the beautiful Monastery of Gracanica. After which we travelled to Prizren, seeing the Ottoman old town, the hammam, mosques, fortress, churches and statues. The trip was completed with a superb lunch before our drive back to Skopje. An excellent trip, highly recommended. Thank you to Robert and Suad for a memorable day. A real cultural tour, giving insight in to Kosovo, past and present. Our tour guide was so knowledgeable and had much passion for his home country, Kosovo. The two cities visited were both very different to each other, making it varied. However there is a fair amount of time on the roads between all cities. I would really recommend this tour to those interested in the history of the area, and for visiting somewhere different. very interesting tour. Our driver was skilled and the guide Jeton was very interesting. He spoke a very good English and knew a lot about the political history of the Balkans. Pristina and Prizren struck me as incredibly quiet places, not yet overwhelmed by tourists. Had a great time with my friends. the guide Vallon was very knowledgeable and did an exemplary job for the entire tour. We visited Prishtina and later Prizren. We took our time in both cities and only returned to Skopje around 2030. I highly recommend this tour. It has been most informative and certainly gave me and my friends a different perspective on Kosovo which we had heard so much of. Special mention must be made to our experienced driver Peter . thank you both of you. Really interesting tour. We were picked up from hotel and met near Pristina by our guide Valon, who is a real cultural ambassador for his country, bringing to life the nuances of kosovan history. Prizren is particularly pretty, and uniquely Balkan. It certainly made us think, and want to read more.